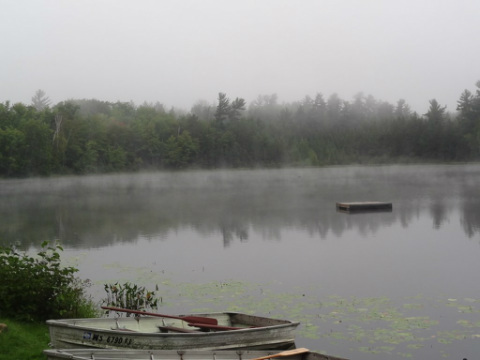 Muskie Lake is a quiet 50 acre lake surrounded by huge white pines and beautiful northwoods forest. Almost half of the shoreline is undeveloped, lying within the American Legion State Forest. The spring-fed lake is more than 40-feet deep and sports great structure, promising action for anglers hoping to catch the lake's many species including muskie, northern pike, largemouth bass, smallmouth bass, crappie, blugill, and pan perch. Muskie Lake is home to a pair of vocal loons and is a wonderful place to enjoy peaceful paddles in kayaks, canoes, or on the paddle boat...you won't find any jet ski's or ski boats on this water! Children of all ages enjoy the 700 feet of frontage at the resort, where they can see (and catch!) countless panfish, frogs, and turtles. Muskie Lake is a true treasure for those seeking the tranquility of the "Old Up North"!